After Racing in PA, I was home for two days and back on a plane headed out to CA for the 2015 Hot Rod Shootout. I am racing 2wd Mod Buggy, 4wd Mod Buggy, and 2wd Mod Stadium Truck. The race schedule is one practice day Thursday, two qualifiers Friday, two qualifiers Saturday, and triple A-Mains on Sunday. 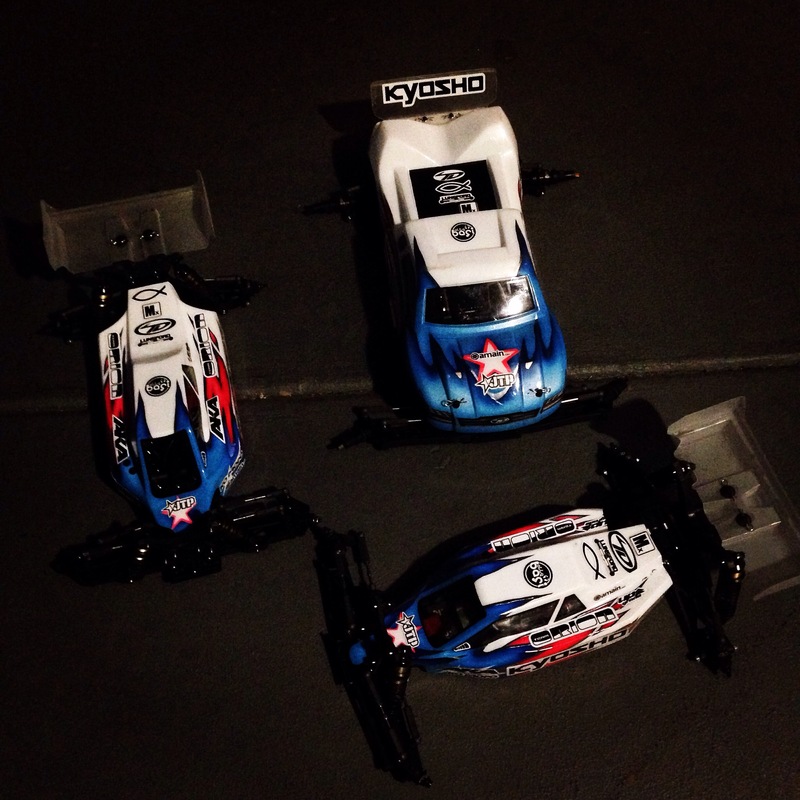 Thursday practice was here and I was quick to get my Kyosho RB6 out on the track. The track is an outdoor, high grip, blue groove track, but it takes a few runs to get the traction up. All my cars were feeling pretty good, and I wasn’t making too many changes. AKA brought our new “long wear” test compounds for all the classes, and they were working awesome. I ended up on Medium Pinstripe front, Medium Chainlink rear on 2wd, Medium Chainlink front and rear on 4wd and truck. This was also the first time for me to test my prototype JTP RT6 front shock tower and front shock mounting. Friday qualifying was here and I was excited to get on the clock and start racing. First up was 4wd. This is the only race we do all year that doesn’t do seeding after practice to set the heats up. It is a total disaster for everybody. The slower drivers have no fun, because they have to pull over all the time and are getting crashed into and yelled at, and it is no fun for the pro drivers who are trying to do their job and get the fastest run possible. It’s pretty lame that this even still happens….ok my vent is over. Q1 4wd was first. My car felt pretty good to start off, and I was fast, there was a great battle for the lead of the heat with myself, Naoto, and Maifield. Halfway through I started to get sketchy and crashed, finished 4th for the round. Next up would be truck. Traffic was totally brutal in my heat and I was passing trucks multiple times on every lap. I had an ok run, and my truck felt ok, a little too hard to drive, and I finished 2nd in the round behind Cav. 2wd was the last to run. My car had been great in practice, and I wanted a good run. Traffic was a little wild, but I was going really fast. I was really close to the current TQ time set by Cav, but cased the difficult triple two laps in a row at the end and ended up 2nd in the round. I was kinda happy with how Q1 went, but wanted clean runs in Q2. I made some changes to my Kyosho ZX6 4wd and it was feeling awesome. Again it was a great battle with Naoto, Maifield and myself. I had a pretty clean, marshal free run going and was in 2nd behind Maifield on the last lap, with two turns to go, a car spun out after the triple right in front of me. I hit their car, not thinking much of it, but the hit was just right to pop off my ball cup, so I limped around the last two turns as fast as I could, but I lost 5 seconds and what was going to be 2nd, or 3rd, ended up a 5th for the round. Total Bummer 😦 Truck was next and just like 4wd, I made some changes, it was a little better, but still not great. Traffic was again totally nuts and I got a 3rd for the round. No changes for my 2wd, I just wanted to focus on making that darn triple clean for the whole 5 minutes. I did just that and put in a great run to take the TQ! 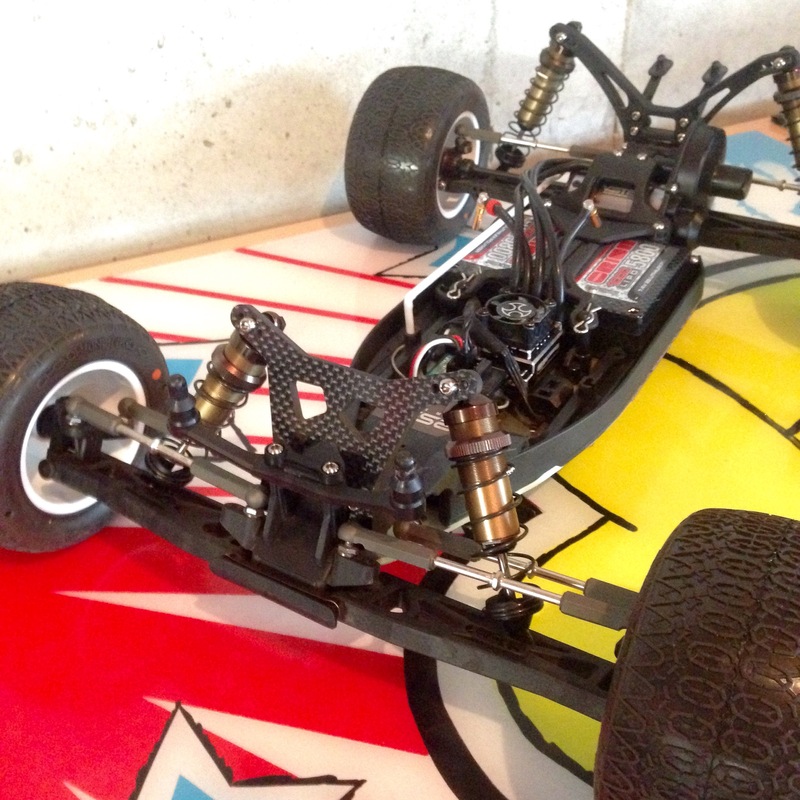 My Kyosho RB6 was great, and my AKA tires were feeling super hooked up and smooth. Saturday was here, but there was some chance of rain….I know right, CA….rain??? Hold a RC race anywhere, and there will be a chance of rain. 4wd was up first, and now the heats were seeded after Q1 and Q2, so the racing would be tighter and faster. I made some more changes and my car was feeling better each time. 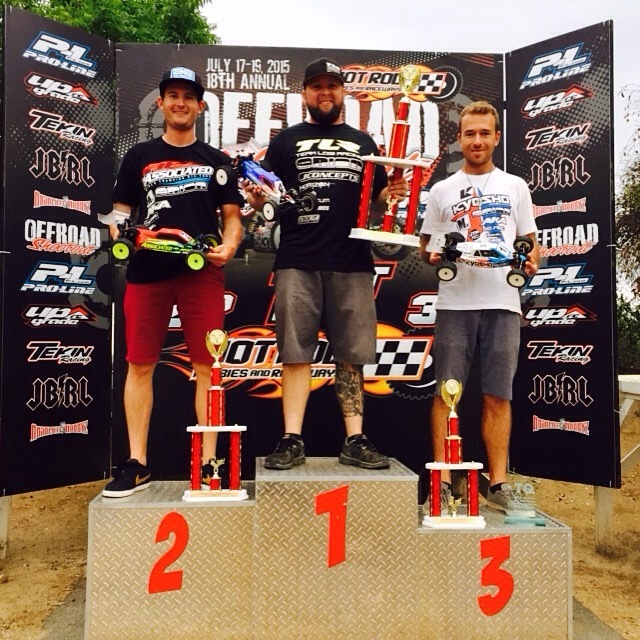 It was a great battle for TQ, with 4 or 5 different drivers leading at different points of the qualifier. At the end I was 4th, and finished 4th for the round. Truck was next and right before Mod Truck started, it started to rain. After a little while it stopped, and we were up. I put on Super Soft AKA tires, went down 2 spring rates, and was just going to go for it. The track was crazy loose, but my truck was going around pretty good. Cav lead for about half the heat, but I was slowly catching him and then took the lead the TQ. 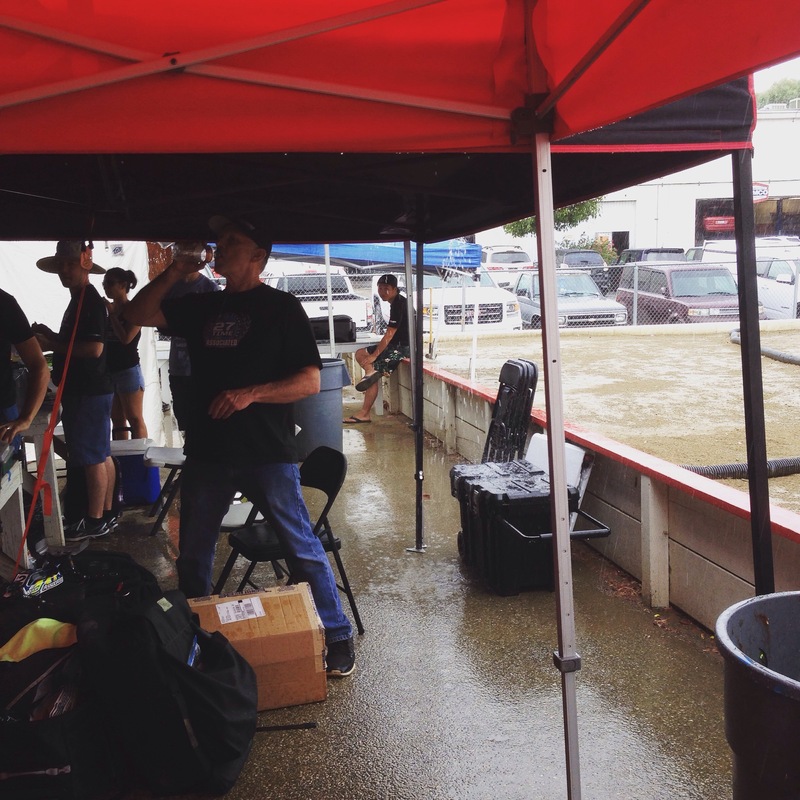 The bummer was that later in the round a total down pour came over the track, and we were done. Q3 and Q4 were cancelled and qualifying would be based off of your best single round point. I ended up qualifying 6th in 4wd, 2nd in truck, and took the TQ in 2wd. It rained all night, so they pushed the start time back an hour for Sunday morning. The track crew did a great job and the track wasn’t near as bad as I thought it was going to be. They ran the lower mains to get the bump up positions for the A-Mains. Around 11am, it was time for A1. The track was drying out, but I would still call it a wet track condition. Tire mounting was hectic all morning, and JP mounted everything we could possibly need, so I was ready. I chose Super Soft compound, but dry track tread, for all A1. I think I made a good choice. 4wd was first, and I started 6th. I had a pretty decent race, pretty boring, got passed a couple crashed cars to get into 4th, but that was about all I had, and that’s where I finished. Truck was next. I felt ok, started in 2nd, but made a pretty big mistake and lost touch of Cav in the lead. I finished a pretty far back in 2nd. 2wd I started on the TQ spot, and I was ready to take a win. I got a clean start, but made a very small mistake on the triple, just coming up maybe an inch short, but the crash sent me from 1st, to 10th. I put in a great charge and went from 10th on lap 1 to pass Cav for 2nd on the last turn. Happy and mad all at the same time. On to A2 and track was getting more dry. 4wd was pretty much the same as A1, passed a couple crashed cars, but didn’t really have pace to challenge the leaders, finished 4th again. Truck was a total disaster. I started off strong, passing Cav for the lead early, and I thought I could take the win, but I made a change to my truck, and it was WAY loose. I ended up crashing some and getting frustrated and dropping way back. Not a good A2. 2wd I started in the lead and my car felt similar to my truck, really really loose. The track was at a weird stage, and I struggled. I held on to the lead as long as possible, but then I dropped back a few spots, another rough A2. A3 was here and now the track was pretty dry, we were back to the dry track tires and almost full dry track setups. 4wd felt really good. I got another clean start and moved into 4th pretty fast, and then almost to the halfway point, the top three all made a mistake over the triple and I moved into the lead. I was feeling good and pushing hard, and I had my Kyosho teammate, Naoto, right behind me and he had a chance to win the overall. I pulled over and gave him the lead, not I just needed to drive good and hold off Maifield and Tessman. We were all going pretty fast, but I had Maifield all over me, and I made a little mistake and he got by. That was not part of the plan, I needed to stay in front of him to help out Naoto. Now I had Tessman behind me, and those three were fighting for the win, so I just pulled over and let him pass. I finished 4th and ended up 5th overall. Truck A3 was good and bad. The start was awesome, I made some changes and my truck was the best it has been all week. I was feeling fast and putting pressure on Cav. I stayed really close for a few laps and then made a darn mistake. I got shuffled back some, then was really fast and trying to come back up through the pack, I hit the back of Evans, and spun him out, it wasn’t all my fault, by I decided to wait, which cost me three more spots. That ended up costing me the overall podium which was a total bummer, ended up 4th. A3 of 2wd, the championship was already decided to Maifield, so my plan was just to have a good clean run and win the last main. I had a really sketchy start and luckily I didn’t crash, but I lost the lead to Cav. We had a good race for the lead, but I wasn’t able to get the lead back, and I finished 2nd, which gave me 3rd overall. Another frustrating weekend, but it wasn’t for a lack of effort. I’m gonna regroup, and come out swinging in two weeks for the ROAR 1/10 Electric Nationals! Thanks to Joe Pillars, my family, my fans, Kyosho, Orion, AKA, MX, Ko Propo, JTP, Amain.com, Upgrade-RC, TD Paint, Lunsford, X-Gear, LiveRC.com, MIP, Bike Source, Specialized, Rock Brook Church, and the Good Lord Jesus Christ. I really enjoy reading your race reviews. 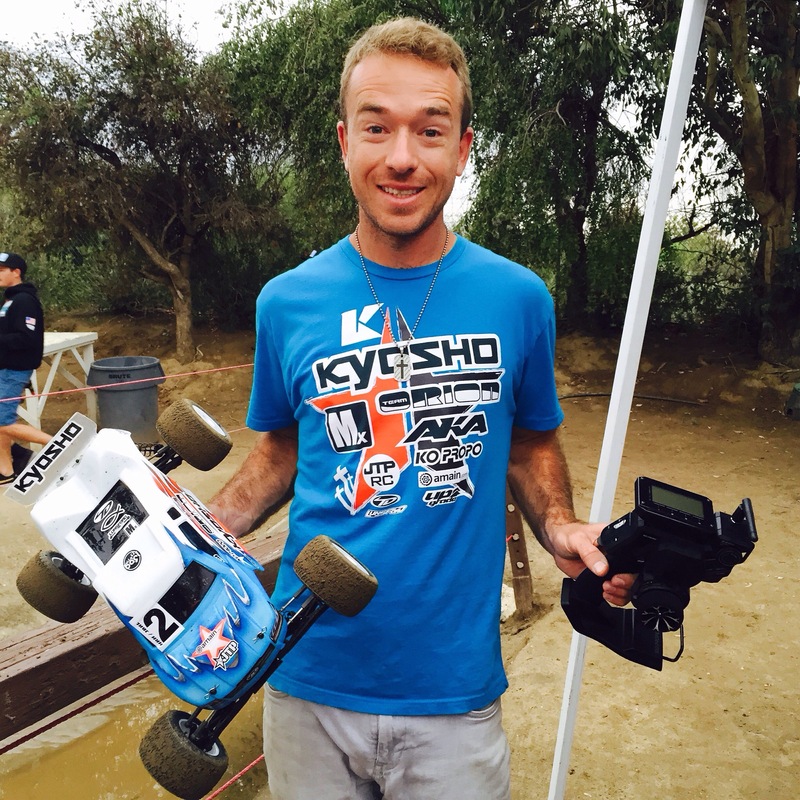 Your writing style is remarkable for an RC Racer. As a Kyosho Electric Car Fan from the 1980’s I really appreciate the new RB6, RT6 etc. My only request is that ypu post more technical data in your rrviews so that everyone of your readers from pro to new drivers can understand. Jack Johnson and Gene Hustings could write like this, and it really helps to dial the car’s. Example, you spoke about changing spring rates and tires, but that was very general. Can you explain the thought process and why you made these decisions? Also, very gutsy move to make major setup changes in between tripple A-Mains. God be with you my friend. I will try to do that more. Thanks for reading my reports and for the kind words. Thank you for being you. God has blessed you with powers your counterparts will never understand. I’ll be in Kansas City, MO tonight. Can we meet at yer local hobby shop? 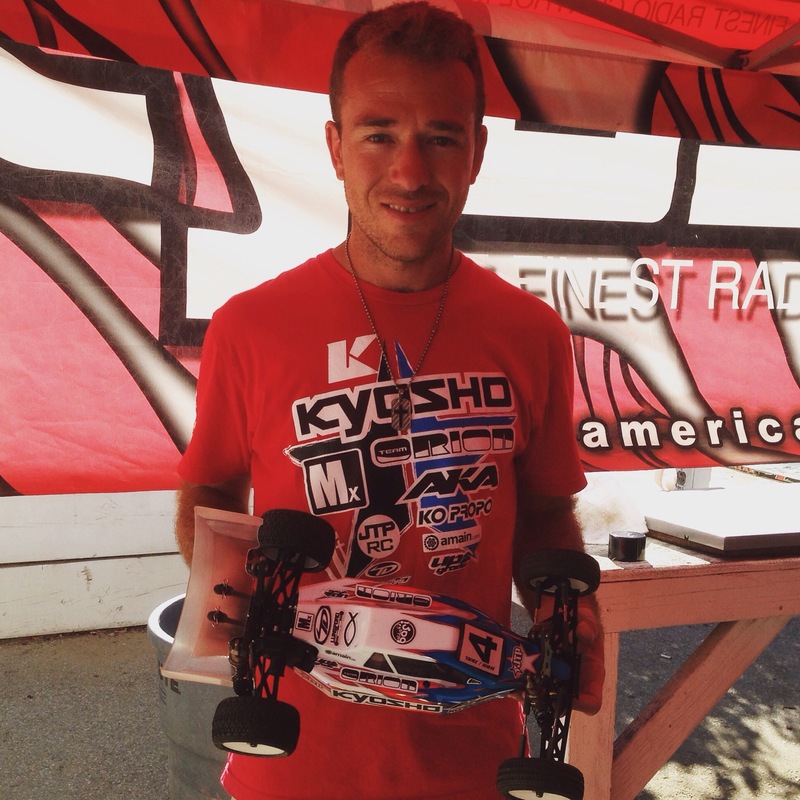 I’d like to discuss Kyosho USA and some secret data that may intrest you going into the iFmar Worlds. Let me know via email, which wordpress has. He Gabe. Sorry I didn’t see this sooner. I’m felling a little burnt out from the summer RC season, taking a couple weeks off to recharge the batteries. What were, or, are you doing out in KC? Thanks for offer on the advice for Yatabe, we did some testing there a couple months back. I feel really confident about what we learned and can’t wait to return for the race. Thanks for the kind words, yes, God has truly blessed me. I try my best to share Jesus’ love, grace, and mercy at the races. I feel bad for a lot of the RC racers, they are so blind to the Truth. Thanks again and sorry we couldn’t meet up.